ID Keys: Black overall, with orange bare skin on face and throat. Small breeding "crests" sometimes difficult to see. The Double-crested Cormorant is the cormorant most likely to be seen inland, and the only cormorant commonly seen in South Dakota. During breeding, two tufts of feathers (the "crests") appear on the head, being black and small in eastern birds, and white and larger on western birds. The feathers are not waterproof, so the Double-crested Cormorant is often seen sitting on a stump or log, wings spread, to dry its feathers. Habitat: Found in a wide variety of aquatic habitats, including large lakes and reservoirs, small ponds, and rivers in South Dakota. Diet: Fish, crustaceans, frogs, salamanders, snakes, and occasionally aquatic vegetation. Behavior: Primarily forages by diving underwater while swimming at the surface, propelling itself with its feet underwater in search of prey. Nesting: May through August. They nest in colonies, sometimes mixed colonies that include various wading bird species. The nest site is an elevated site above or near water, such as a tree or cliff. They will also sometimes nest directly on the ground on islands, provided the island location provides protection from predators. The nest itself is a platform of sticks, lined with finer vegetative material. The female lays between 2 and 6 eggs, and both parents help to incubate them. When the eggs hatch, both parents help feed the young. The young leave fledge after about 6 weeeks, but typically remain in the care of the parents for another few weeks after fledging. Migration: Birds in the interior of the country migrate to the coasts or extreme south in the winter. Similar Species: In South Dakota, the only other cormorant species that has been seen (rarely) is the Neotropic Cormorant. Those two species are roughly similar in appearance, but the Double-crested Cormorant is much larger. 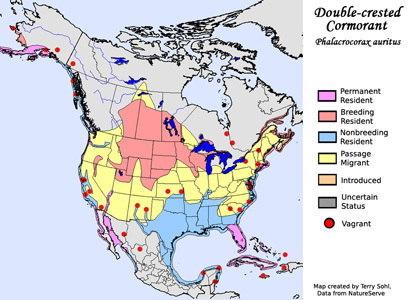 Elsewhere, Double-crested Cormorants may be confused with other cormorant species, including the Great Cormorant on the East Coast of the United States, and the Brandt's Cormorant and Pelagic Cormorant on the West Coast. Status: After a considerable decrease until the early 1970's (probably due to DDT and other pesticides), Double-Crested Cormorants are now increasing both in numbers and range. 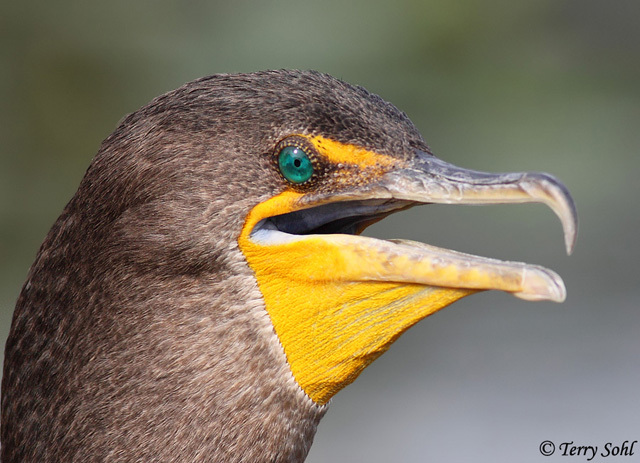 The IUCN lists the Double-crested Cormorant as a species of "Least Concern". Note the species has recovered so well that they are (wrongly!!!) being considered as a "pest" species in some areas. In the Great Lakes area, for example, there are discussions of culling Double-crested Cormorants, with fisherman claiming a rise in populations is impacting game fish populations. Additional Photos: Click on the image chips or text links below for additional, higher-resolution Double-crested Cormorant photos. South Dakota Status: Common migrant and summer resident throughout the state.